After several days of tiresome wandering, he felt both weary and empty. Only one thing kept him going. He sat down and rested his back towards the trunk of an old oak, watching his young squire; The boy had grown more and more uneasy as they rode closer to the mountains. Well, he would have to continue ahead alone from here. No doubt the boy would protest a bit to part with him now, though he would be relieved with getting another assignment instead. "Delivering an important message," he thought and smiled to himself. He found some parchment and a pen in his saddlebag, and started writing a letter to Her - The dark and mysterious woman in his life. With great care and his finest handwriting, the words took shape on the brittle paper. Luckily the stick was made of hard wood, so the letter wouldn't be damaged inside it. 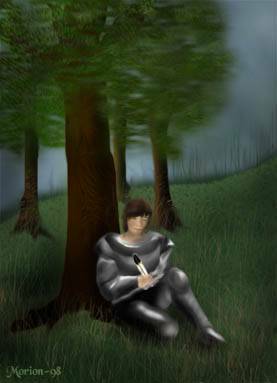 The rumors of the highwaymen near Lady Morion's castle worried him more, he would have to ask the young man to be on guard at all times. My dear Lady Morion, he wrote, the Joy of my heart. A few days ago I had a vision: Both you and your gems came to me in the evening, beautiful and serene. The thought of you being so far away was easier to bear afterwards, almost magically so... Is it maybe yours and your crystals' magic that has come to aid me? I saw your crystal so clearly, I almost could feel its magical power fill me. And the beauty of the orb can only be measured against yours - I've recalled these images several times lately, when I've needed the strength, and it has always given me to courage to spur the horse and continue on the quest.